When I was born in Kyoto my father was still at Kyoto University studying under the late Kenichi Fukui. My grandparents on both sides had been against their marriage - my father a merchant class boy from Kansai shunned as lower-class by my mother's noble family from Northern Japan. My father's family wanted him to marry someone who was healthier and more likely to be a hard-working member of their family. 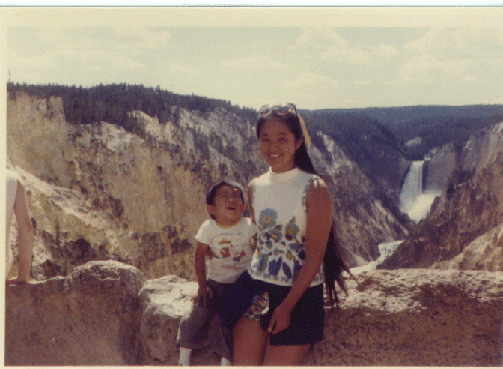 Because of this, my parents were rather poor, lacking any support from their families. We lived in a dumpy home and they struggled to make ends meet. Kenichi Fukui's wife, Tomoe, had a brother who knew people in the Geisha district, Gion. Through this connection my mother was able to get a job teaching English to geisha and maiko in Gion. They called her "Momoko-sensei". She taught at a geisha teahouse called Minoya. Later, we moved to the US. Kaoru, the teenage daughter of the mistress and owner of Minoya wanted to visit the US. My parents agreed to let Kaoru come and stay with us for six months or so in exchange for baby-sitting. Kaoru was 18 and I was 3. We were so poor that my father once scolded Kaoru for eating too much food. ;-) Kaoru returned to Kyoto and eventually took over the family business of the geisha teahouse which she continues to run today. I kept in touch with Kaoru over the years and I have made a habit of popping down to Kyoto whenever I can to see her and my other friends there. Kaoru is my guide and interface to Kyoto. She reminds me that when I visit a famous philosopher's house, that I should NOT, even when asked twice, actually accept the invitation for tea. She tells me how to deal with restaurant owners, geisha, maiko and monks... without her, I would never be able to navigate the exceedingly complex social system of Kyoto. She still treats me like a 3 year old boy sometimes and embarrasses me to no end by continuing to call me by my baby name, "Jon-bon"... which as a result is my name among all of the geisha of Gion. 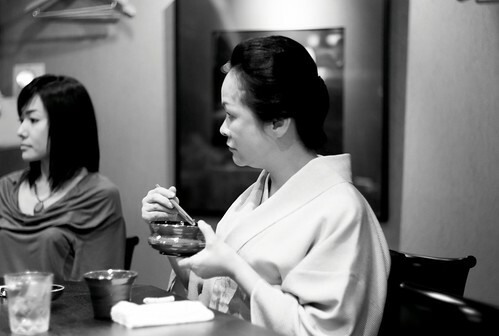 The benefit, however, is that many of the geisha and maiko are like family. Even though I only lived in Kyoto as a baby, Kaoru and my geisha and maiko friends in Kyoto really help me continue to feel like Kyoto is my home. They provide me with an essential culture backbone to my Japanese nationality. Having a connection with Ochaya-san (the owner of "geisha teahouse" as Joi writes) is simply unbelievable, for a guy like me who is from a uncivilized area like Tokyo. All I know about Ochaya is that it's for real adults and it's not something you can just drop in. It's not something for a foreigner like me. This is fascinating. Now, I truly feel like an elephant in a china shop. I like complexity, so I am very curious how all of this social complexity actually meshes together. Thanks for sharing these touching portraits and stories. I enjoyed that. The whole series of photos/capsules has been interesting, but this one felt more personal - thanks for sharing that with us. That you shouldn't accept the invitation for tea? The the invitation for chazuke is famous, but I've not heard about tea. Tell us more, please. Often, you will be asked several times to stay and have tea, and in almost all cases, this is a mistake. Once, Kaoru had to pull my sleeve to stop me from accepting an offer for me to stay. On the other hand, it is common to visit for tea, but usually it is clear in advance that you are being asked over or tea. It's rather subtle though and confusing for me sometimes, but it appears to be quite clear for people like Kaoru. Also, there are families that have sort of opted out of participating in this social system, like the Fukui's, and you can sort of take what they say at something closer to face value. I have heard stories of wives getting on a bus for a trip... The wives had to enter the bus in the order of the importance of their husbands. One wife had a bag that was expensive beyond her status in comparison with the other wives and it became the talk of the town. When we lived in Kyoto, some people gossiped about how often we appeared to be eating meat consider how junior our father was. It's not a very friendly system and I probably wouldn't survive on my own. People in Kansai are speaking different dialects from Tokyoites, especially in more indirect manners to express their real feelings, and it's hard to guess whether a person is really angry or not, and whether a person likes you or hates you. Kansai corporate culture is more autocratic and hierarchical than Tokyo's. In short, it's an old and traditional Japan (which I do not fully understand and often refuse to accept). I don't want to be misunderstood, so I intentionally alienate myself from surrounding people by NOT speaking Kansai dialects (there are many many variants) and stay as I am as myself, though I try not to offend others as possible. The location of Kyoto makes it a very interesting place, as a gateway city for people in Hokuriku and Tohoku regions to go to the Pacific Belt regions (i.e., Tokyo - Nagoya - Osaka - Hiroshima - Fukuoka, where the industrial Japan is). I see many people from Tohoku region in Kyoto University. On the other hand, Osaka is full ofimmigrants from Kyushu, Shikoku, Chugoku and Okinawa regions, in short the western half of the nation. This is probably the best of this series. How time flies. From a young pretty girl to a beautiful obasan. From a little kiddo, now a blogging man. 1) In your first year as a maiko, you do not put lipstick on your upper lip. That is only allowed after the first year! 2) Most maiko and geisha do no come from Kyoto. Maybe Kyoto girls know so much about how hard that life is (long hours, lots of lessons, many strict rules) that they instinctively shy away from it. 3) Maiko live in an Okiya (literally, "place to put stuff") which takes care of all their expenses (kimono, wigs, head ornaments, makeup, etc.) It is not indentures servitude, they can quit, and many do, but you do end up owing the Okiya money for all the expenses they've put up. When the graduate to be a geisha (it takes about 5 years, so they are around 20), they become independent, and then patrons have to help with their expenses. It is a completely free system now, but Kaoru-san remembers when she was young, girls crying because they were being "given" by their families to the Okiya. 4) Nobody had seen "Memories of a Geisha" and no-one wanted to. 5) If you are a patron of an Ochaya (as Joi is of Minoya), you cannot "play around" and go to other Ochaya. You can go as a guest if someone else invites you, but you cannot be the host at another Ochaya. You will be viewed as lacking in loyalty, and you will embarrass that Ochaya, because people will think they are stealing customers. So it's not like a restaurant, much more like a British gentleman's club. Kaoru-san said that sometimes she will get a call from a clueless company or a hotel making a reservation from someone who is a customer of another Ochaya (they all know, by the way). She will gently ask them if perhaps they are mistaken since that person is a customer of a different Ochaya. What happens, by the way, if you start breaking these rules, is you get ostracized as a "clueless person". That means that none of the Ochaya will take your reservations (no big deal if you are a one-time tourist, but a big deal if you live in Kyoto and entertain at Ochaya). 6) Ochaya only accept customers who are regulars or referred by regulars. ("Ichigen-sama okotowari", which literally means, "We respectfully decline honorable first-time visitors"). This is important for many reasons, but most importantly the idea is that they don't know how to entertain you properly unless they know something about you, your background, your work, your tastes, etc. Also, since they mail you the bill later, they need to know you're not a deadbeat or poor! Anyway, it was a great, great experience. I'm going back (after I take a look at the bill when it comes in the mail!). Thank you Makihara-san for the detailed explanation. Your explanation reaffirmed that those maiko-sans and okami-san (i.e., Kaoru-san, aka the owner of the Ochaya) are real professionals. I've also heard that most of maiko are from out of Kyoto. The ichigen-san-okotowari principle is common among Kyoto and many Kansai merchants and service providers. You've got to have someone who can introduce you as a trustworthy customer. Joi,speak about amazing connections... I studied Prof. Fukui's work many years ago and heard him lecture on it at some time. The elegance of his work is admirable - and surely with roots far beyond quantum theory, after reading this account of yours. Joi Ito - "Kaoru Yoshimura" by Joi Ito is licensed under a Creative Commons Attribution 4.0 International License.